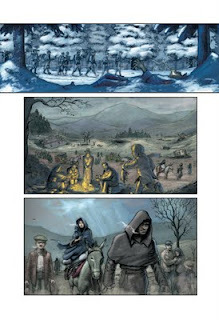 Rex Mundi page, what a cold winter feeling! I can't wait for the worm weather to arrive. This belongs to the last rex Mundi Trade, we're doing some extra pages for it. hope it will worth the extra penciling and painting. Como va Juan. Siempre impecable tu work che. Un lujaso. Uno de estos días voy a pasar por llantodemudo a ver si tengo suerte y consigo alguna de tus publicaciones. De uan. Un abrazo y tamos en contact. Hi I'd love to thank you for such a terrific made site! Just thought this is a perfect way to introduce myself! I wish not approve on it. I assume nice post. Specially the title attracted me to read the unscathed story. Good post and this mail helped me alot in my college assignement. Gratefulness you as your information. Por favor, comunicate conmigo a tango4you@aol.com, de la revista Tango Reporter, EEUU, que estoy armando un numeroo dedicado a "Gardel y las Historietas".